HURRY! 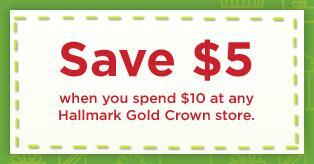 There is a $5 off $10 at Hallmark printable coupon on their Facebook page. Simply “like” them, then click on the “Special Offers” tab (left side) to print a *HOT* $5 off $10 Hallmark Gold Crown store purchase coupon! You better act fast this isn't going to last long, as this is limited to the first 35,000! Coupon valid through Sunday November 13th!